I just started using a clock and I can't find an answer to my question. If player A's clock expires before player B's but player A has many pieces remaining and player B has far less, who wins? When your flag falls (as you can see on the right clock above) you lose on time no matter how good your position is or how much material you may have. This all does not matter at all. Only the time counts. So make sure that you have always enough time left to finish your game. If you have more material this will not help you when you have just a few seconds left and your opponent has a minute left. It is a good idea to specialize on some openings and play the first ten moves or so quickly without thinking. This saves time. Make sure that you have around the same time left on your clock as your opponent. Don't let him run ahead on time. While playing always keep an eye on his and on your time. By the way, it is only allowed to hit the chess clock button with the same hand which makes the moves on the board. So if you are left-handed then make your move with your left hand and hit the chess clock button also with your left hand after making the move. It is not allowed to make moves with your right hand and touch the clock with your left hand while playing because some players can manipulate the clock this way. 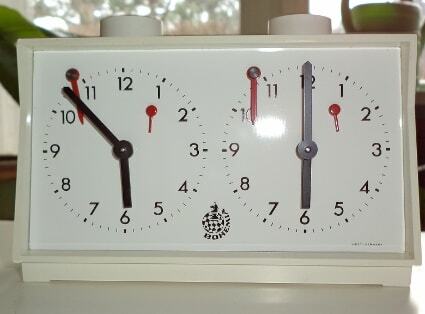 Black can choose on which side the clock has to be placed. If you deliver a checkmate, the game is over and you win, no matter what is noticed about the time on the clock after that. If the position has no possibilities of delivering a checkmate then the game is a draw. For example you can't play on with the bare kings on the board because giving checkmate is not possible for both sides. Generally a player should not speak during the game, except to offer a draw or resign. You should not announce a "check" in official games as this will distract or annoy your opponent. You should not repeatedly offer a draw as this will annoy your opponent as well. You should not hit the clock button aggressively as this might damage the clock or will distract or annoy your opponent.